Scot McKnight called Beyond Reasonable Doubt, “A Book That Cannot Be Ignored.” The book is available on Amazon. Book Review of How to Be Evangelical without Being Conservative, by Roger E. Olson, in Stone-Campbell Journal, vol. 14, no. 1 (Spring 2011), 132-33. “A Beautiful Deed in the Midst of Betrayal: Mark 14:3-9,” Leaven, vol. 19, no. 1 (First Quarter 2011), 37-41. Book Review of For God Alone: A Primer on Prayer, by Bonnie Thurston, in Stone-Campbell Journal, vol. 13, no. 2 (Fall 2010), 275-76. 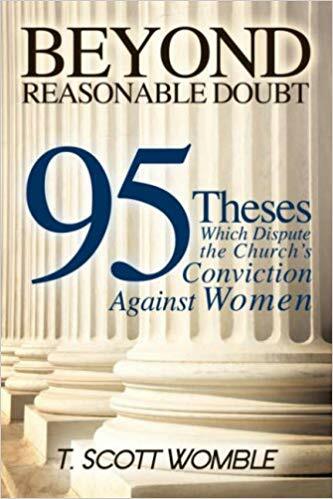 Beyond Reasonable Doubt: 95 Theses Which Dispute the Church’s Conviction Against Women. U.S.A.: Xulon Press, 2008. Book Review of What Has Christianity Even Done for Us? How It Shaped the Modern World, by Jonathan Hill, in Stone-Campbell Journal, vol. 9, no. 2 (Fall 2006), 263-64. Book Review of Recovering Biblical Ministry by Women: An Exegetical Response to Traditionalism and Feminism, in Stone-Campbell Journal, vol. 8, no. 2 (Fall 2005), 276-77. Book Review of Men and Women in the Church: Building Consensus on Christian Leadership, by Sarah Sumner, in Stone-Campbell Journal, vol. 7, no. 2 (Fall 2004), 292-93. Book Review of Exploring Christian Spirituality: An Ecumenical Reader, by Kenneth J. Collins, ed., in Stone-Campbell Journal, vol. 4, no. 2 (Fall 2001), 290-91. Book Review of Making Sense of Paul: A Basic Introduction to Pauline Theology, by Virginia Wiles, in Stone-Campbell Journal, vol. 4, no. 1 (Spring 2001), 151-52.